Welcome to SCTA'S Birth/Natal & Numerology Chart Page, every order of either Chart 50% goes to feeding Wildlife, and Dog & Cat food for the Animals at the Plainfield Area Humane Society! While learning about yourself and your personality things you could change and finding some hidden talents, you will also be helping feed Animals who need it. There will be more Charts, and handmade Jewlery added to this Site so come back and visit often so you don't miss all that is coming soon. A Natal Chart is a map of the Universe, it is calculated for the exact time and location of your birth for the purposes of gaining insight into the your personality, talents, abilities and challenges you may face. also called a "Natal Chart" which is a "Birth Chart." �The Chart shows the positions of the Sun, Moon, and Planets and other Celestial objects, all referred to as the "Native's Planets," within the frames of reference defined by the Astrological Signs and Houses. "� The accurate Birth time, is the time of your first breath, and the location is deemed necessary by Astrologers for the calculation of the exact degree of the signs that are rising, setting, culminating up, and culminating down, known respectively as the Ascendant or Rising Sign, Descendant Midheaven, and/or lower Midheaven. If you don�t know you exact Time of Birth then your chart will be what is called a �Sunrise Chart.� �Sunrise is the �birth� of the day at a particular location, and it will resonate for those persons born on that day, at that location. 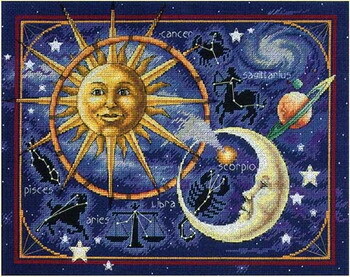 �The positions of the Natal Planets are calculated for Sunrise on the date of birth. The Sun is placed on the Ascendent, the Eastern Horizon, and 12 Solar Houses are calculated uniformly (equal house system) from that position. With this chart, the Ascendant Sign and Moon Sign may not be accurate but all other aspects of your chart will remain the same. 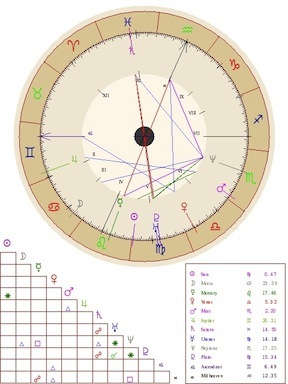 Each paragraph of interpretation refers to an individual position in your chart. All of these positions and aspects are some of the "parts" that make up a "whole"--you! Some of these interpretations will be contradictory, just as people are contradictory. A person can be downright timid in love, and that same person can be aggressive in business. Not only that, we evolve and grow throughout our lives, facing challenges that help us to handle our positions and aspects in a different way. We all have choices, and one of the largest benefits of astrology is the ability to understand ourselves better so that we can work with our natal charts rather than against them. Some of the interpretations that follow are detailed, while others are brief. It is very important to fill out everything on the form, if you don't know the exact time of Birth check the "Not Know" field, and if you don't know your exact Birth Place please put the closest City to where you were born. I will then send you your complete personal Birth/Natal Chart to your E-Mail along with the actual Wheel with all the Planets, etc. in their positions, it will look exactly like the one shown on this web Site.